Today, when you order "Bill in Lemon Book by Scott Alexander - Book", you'll instantly be emailed a Penguin Magic gift certificate. You can spend it on anything you like at Penguin, just like cash. Just complete your order as normal, and within seconds you'll get an email with your gift certificate. Scott Alexander has established a reputation as the "go to guy" on the bill in lemon effect. His breakout trick of 2004 "The Final Answer" (long out of print) is sought by many magicians "in the know." 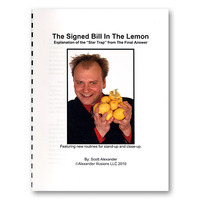 Now, in this manuscript, Scott tips all the thoughts and inspirations that let up to the final answer, including his unique star trap work that can be put into any lemon in moments, allowing you to load a signed bill and have a spectator look right at the dirty work without seeing a thing. Also featured in this volume are two FULL ROUTINES, one for close up and one for standing up on stage. The stage routine even works for walk around situations, it's that simple. Scott includes valuable performance tips garnered during his tenure as a magician in residence at Bill Malone's magic bar in Boca Raton. You will also learn vital psychology on how to really sell this miracle to the audience. Scott covers why a signed bill is the only way to go, and more importantly, how to get the $100, $50 or $20 dollar bill as a tip, if you are working in bar and restaurant situations. 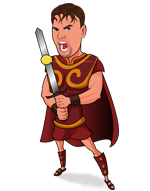 Chris Randall of Las Vegas says "Wow, this is great! I'll never do the torn corner again." Let Scott help you take your bill in lemon to the next level!